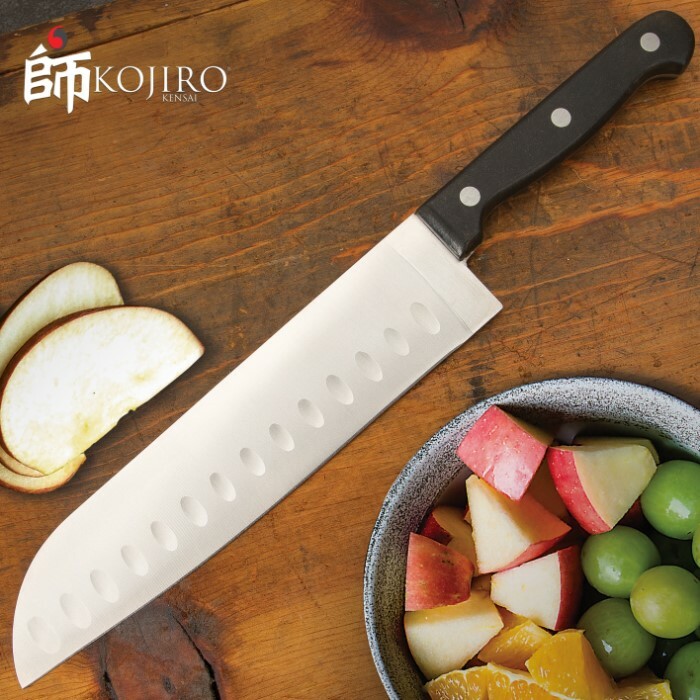 Professional Chefs Santoku Knife | BUDK.com - Knives & Swords At The Lowest Prices! Finding yourself forever hunting the all-purpose kitchen knife that you can actually put in the dishwasher? 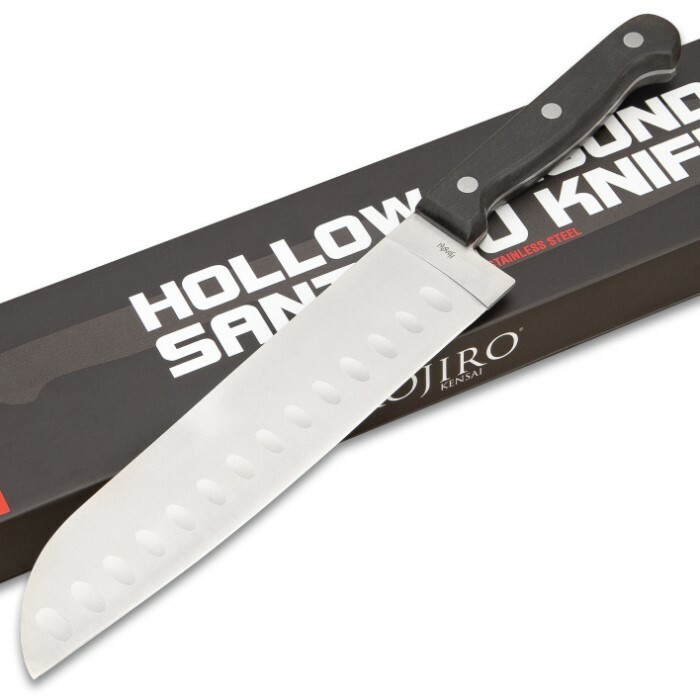 Well, look no further than this Santoku knife for the ultimate kitchen tool. Nearly all of the ones I have bought come reasonably sharp. I always check every knife before I give it. So many people don't have decent kitchen knives especially divorcees and young singles. Pair this with the 3 pack of paring knives and a cutting board and you look good. I have also tested this knife on plants and bushes in my yard with good results. This Santoku knife is a bargain for the cost. For about four bucks you can't beat it! Yes,it could come sharper,but if you can't sharpen a knife on your own,what can I tell you?!? I bought several and I gave some,sold some,and saved a couple for my own use. Get you some! Sharp, comfortable and comes with an neat case. Oh yea, and it's on clearance for less than 4 bucks. Get yourself one. If you like it, which I think you will...get a bunch more. Add them to gifts for friends and loved ones. They never have to know it costs you $3.98. I won't tell. That's less than the greeting card that would go with the gift. Personally id much rather have this knife than a greeting card. Just saying. As a number of reviewers have noted, these knives (I got the twofer deal) do NOT come sharp. I find bread to be a good test of knives with non-serrated blades, so I tried slicing croissants for sandwiches. The knife sliced the thicker sections, but invariably tore the thinner areas. A little work with the sharpener should cure this problem, but how much more would it have cost to deliver it with a usable edge? My sister bought this knife before and I think it was sharp, however the one I recently ordered came very dull. I was disappointed. i think I'll have to spend a lot of time with this and the sharpening stone. I guess this buy is often a hit and miss...Maybe if I buy another it will be sharp. I bought 50 or more of these. WHY? To hand out to the LADIES. I've scored so many points I can't haul 'em all in a PU truck. GUYS! I bought those knives for less than 5 bucks apiece. You know you need points, boys. Jump on it! Save your selves from your next screw-up! Wisdom, boys, wisdom. Awesome knife,purchase 2 one for me & one for my son. Great value for the money. A good value, great balance , but mine needed to be sharpened before use. But for $6 maybe that should be expected. I will use it.